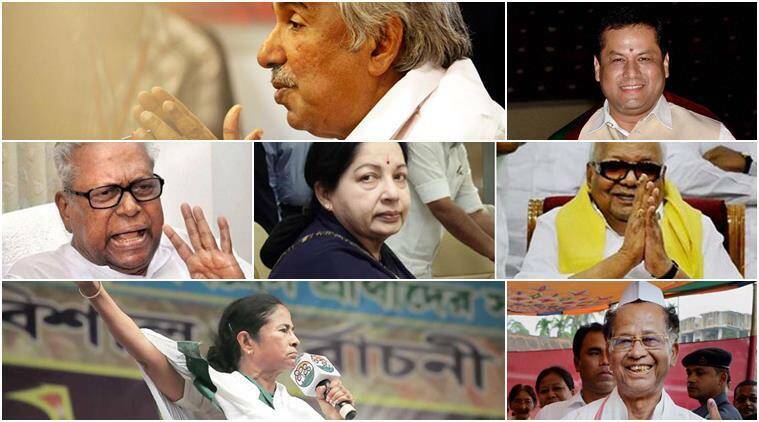 All eyes are now set for the May 19 counting as electoral battle in five states Kerala, Tamil Nadu (minus two seats), West Bengal, Assam and Puducherry came to an end on Monday. Voting for Tamil Nadu, Kerala and Puducherry ended on Monday. As the curtains came down Monday on assembly elections in four states and an Union Territory, exit polls predicted an anti-incumbent mood in all states except West Bengal. All polls predicted a BJP win in Assam, raising party hopes of its first government in a north-eastern state when votes are counted May 19. The Congress, which pollsters said was set to be dislodged from Assam after 15 years, seemed to be on its way out in Kerala too with exit polls predicting the return of the CPM-led Left Democratic Front. The Congress can, however, draw solace from its projected victory, in alliance with the DMK, in Tamil Nadu and Puducherry. Exit polls showed that the AIADMK is unlikely to break the anti-incumbency jinx in Tamil Nadu where ruling parties are being regularly voted out since 1991. Of the four exit polls released for Assam and West Bengal after polling ended, the BJP had a clear majority in three and the TMC in all. In Assam, the BJP is set to clear the half-way mark of 64, according to ABP-Nielsen, News X-Chanakya and India Today-Axis with 81 seats, 90 seats and 79-93 seats, respectively. India TV-C Voter predicted a hung assembly with a range of 53-61 seats for the BJP. The BJP made strong inroads in Assam in the 2014 Lok Sabha elections where it got a majority in terms of leads (69 out of 126 seats), and a voteshare of 36.9 per cent. Assam is particularly important for the Congress and BJP because, besides being the only Congress-ruled state among the four that went to polls, it is also the only one in which the BJP thinks it can capture power. For the BJP, a government in Assam would silence growing scepticism about Prime Minister Narendra Modi’s popular appeal and party chief Amit Shah’s image as a master strategist. If the exit polls are correct, the party will have to find a replacement for Sports and Youth Affairs Minister Sarbananda Sonowal who was projected as the chief ministerial candidate there. Mamata Banerjee’s Trinamool Congress (TMC) is the only party beating back the anti-incumbency wave. It is expected to make an impressive comeback in West Bengal. The ABP-Nielsen, News X-Chanakya and India TV-C Voter gave 178 seats, 210 seats and a range of 163-171 seats. According to the India Today-Axis survey, too, the TMC will get a clear majority with anything between 233 to 253 seats. The grand alliance of the Left and Congress are lagging way behind with 110 seats in the ABP-Nielsen poll, 70 in News X-Chanakya, 112 to 128 seats in India TV-C Voter and 38 to 51 seats, according to India Today-Axis exit polls. The half-way mark in West Bengal is 147. Of all the states, the contest appears to be the closest in Tamil Nadu, according to the exit polls. India TV-C Voter is the only poll that expects the AIADMK to return to power with anything between 135 and 143 seats. The DMK, according to this survey, would get between 74 and 82 seats. The remaining two polls, India Today-Axis and News X-Today’s Chanakya, gave a majority to DMK in the range of 124 to 140 seats and 140 seats, respectively. The half-way mark in this state is 118. Elections in Tamil Nadu saw the Election Commission of India deferring polls in two constituencies on account of attempts to bribe voters. Polling in Thanjavur and Aravakurichi constituencies will be held on May 23 and results will be declared on May 25. The amount of illegal cash seized in the state, purportedly used to influence voters, has crossed Rs 100 crore. In Kerala, the India TV poll showed the LDF getting 74 to 82 against UDF’s 54 to 62. The India Today-Axis polls gave 88 to 101 seats to the LDF, and 38 to 48 to UDF. The half-way mark in Kerala is 71.